The wife of the Florida neighbourhood watchman acquitted of killing an unarmed black teenager has been convicted of perjury. Shellie Zimmerman, 26, admitted having lied about how much bail money the couple could afford during a hearing after her husband's arrest. She was sentenced in Sanford, Florida, to one year's probation and 100 hours of community service. George Zimmerman, 29, was acquitted in July of Trayvon Martin's murder. He admitted shooting the 17-year-old in the Orlando suburb of Sanford last year, but said it was an act of self-defence. At a June 2012 bail hearing for her husband, Shellie Zimmerman said she did not have much money because she was a full-time student and her husband was not working. Prosecutors argued that an online fund set up to pay for Mr Zimmerman's legal defence had collected $135,000 in donations. But she told the judge that she did not know how much money the website appeal had raised. According to court records, in the days leading up to the hearing Shellie Zimmerman transferred $74,000 (£48,000) from her husband's bank account to her own, in smaller installments that would not alert the tax authorities. More than $85,000 was moved back into Mr Zimmerman's account four days after he was released on bail. Before the hearing, a further $47,000 was moved from Mr Zimmerman's account to his sister's bank. Jail records also show that on a phone call while still in custody, Mr Zimmerman told his wife to "pay off all the bills" on a bank card. 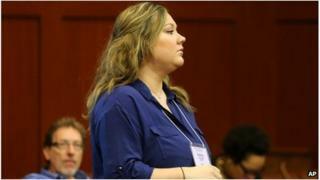 After Wednesday's hearing, Shellie Zimmerman's lawyer, Kelly Sims, said her client had accepted responsibility. "She was scared," the attorney told the Associated Press news agency. "Her husband was locked up. "She didn't know what was going on. So, she stood by her man, like Tammy Wynette says. She's accepting responsibility." Mr Zimmerman's bail was initially posted at $150,000 and he was released after posting $15,000 in cash. But after Shellie Zimmerman's false statements were discovered the judge revoked the bail and released him later on a $1m bond. Who, what, why: Who was Emmett Till?